Town President Larry Dominick and members of the Town Board joined representatives of the Blackhawks, Wirtz Beverage Illinois and about 600 residents to unveil a statue commissioned to honor hockey Hall of Famer Bobby Hull. 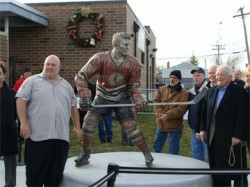 The statue is located in front of the Bobby Hull Community Ice Rink that was constructed in the Fall of 2011 as a part of improvements at Community Park funded by Wirtz Beverage Illinois and owner Rocky Wirtz. The Bobby Hull statue is the second now in Chicagoland, with one dedicated at the United Center Stadium on Madison Street in Chicago and designed by famed artist Oscar Leon through the prestigious Rotblatt-Amrany Fine Arts Studio of Highwood Illinois. Wirtz was represented by its chief attorney Anthony Iatarola, who shared a story he said took place while the Wirtz Building and hockey rink were being built last year. After unveiling the Bobby Hull Statue, residents lined up to skate at the ice rink which remains open through the Winter, free of charge to residents. Attendees not only received autographs from Hull, they were treated to an array of entertainment including music, reindeer driven hay rides, clowns, magicians, rides and refreshments. Omri Amrany owner of the studio, Rotblatt-Amrany Fine Arts Studio in Highwood, Illinois, introduced Oscar Leon, the artist who designed the Hull statue. The Amrany studio has designed many other statues including The Spirit: Michael Jordan Statue, Kareem Abdul Jabbar, the Memorial to Pat Tillman, the Vince Lombardi Statue, the Al McGuire Statue, and the statue of Stan Mikita along with many others.